There are two dates in every year that I’m most “afraid” of. One of those dates is New Year, the other is my birthday. When those days come, I receive so many messages and I’m always overloaded with well wishes from everyone. It puts me under a lot of pressure. 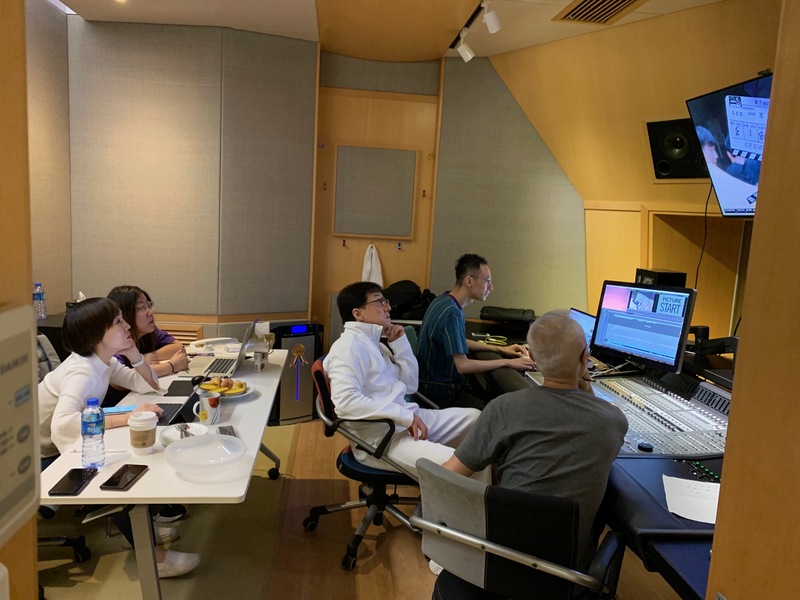 Today is like any other day and it’s work as usual in the editing room. This is my birthday cake! Ha ha! Even though I don’t like celebrating my birthday, but I still have to say a heartfelt ‘thank you’ to all your birthday wishes. 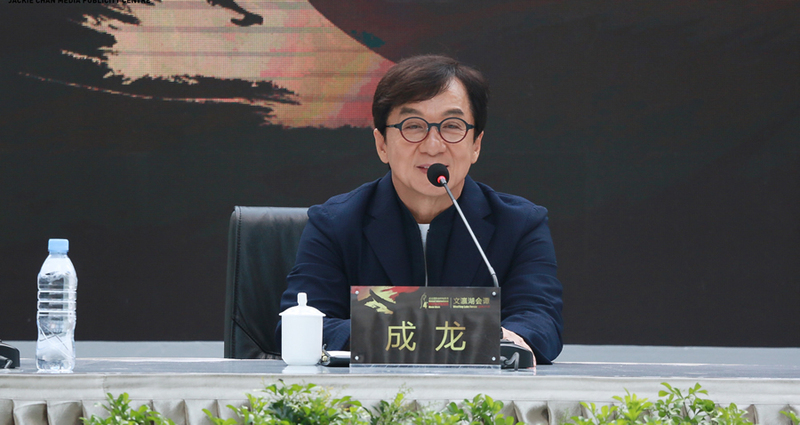 I also have some special news that I’d like to share with my fans: this year in July, the 5th Annual International Jackie Chan Action Movie Week will be held in Datong, Shanxi. 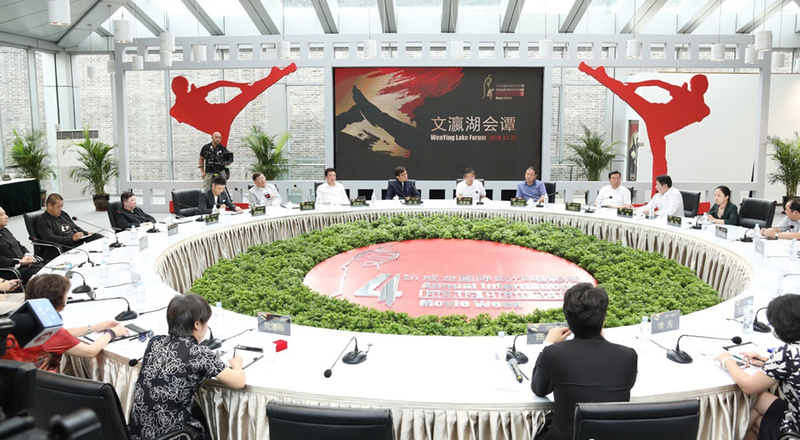 Not only will there be films from various parts of the world participating in the event, action stunts representatives from all over the world will also be invited to attend. I also managed to obtain a small bonus for everyone and would like to invite my fans to attend the awards ceremony as well! If you’d like to take part this summer, please go to my official website: jackiechan.com/scrapbook for more details and fill out the form. I’ll be waiting for you in Datong. Happy Birthday to Me! To me, protecting the environment is equally important as making films. 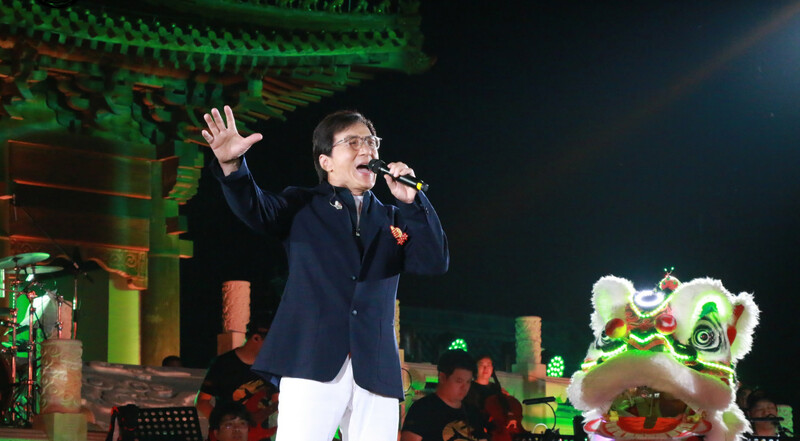 Last year in May, my “Jackie Chan Environmental Protection, Art Exhibition and Museum” opened at the Ancient Residence Garden in Bangbu, Anhui. Now, after many months of preparation, I’m pleased to see my exhibition at The Leonardo Museum in Salt Lake City, Utah. I hope to bring the concept of environmental protection, recycling, re-using and re-designing all over the world. And I hope each and every one of us can also become a “Green Hero”. Today is our last day filming in China for “My Diary” (Wo De Ri Ji). 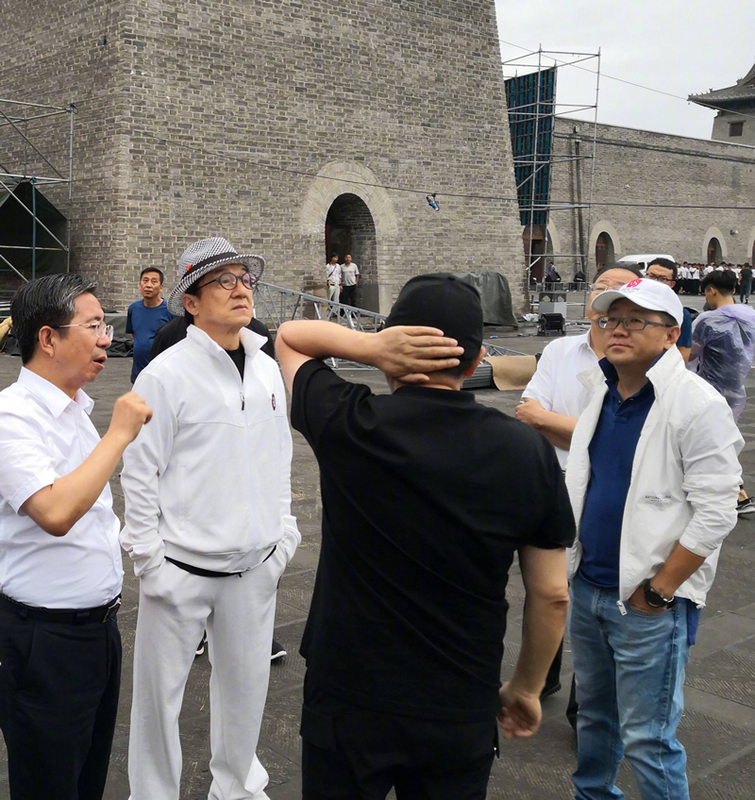 Soon, we’ll be changing locations and will continue shooting overseas. 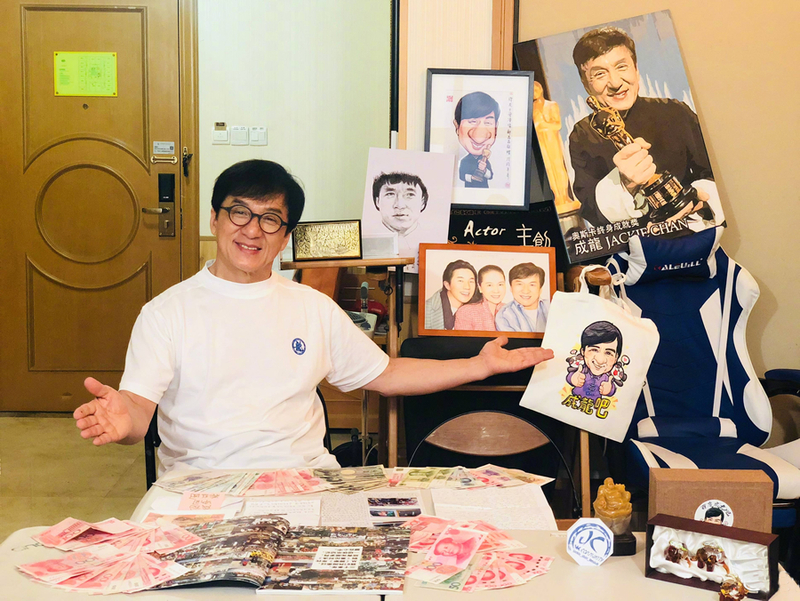 Before heading to the airport, I had to open all the letters, gifts and donations from my fans. I can see that my fans have put a lot of heart into these gifts. Thank you so much! I’ve opened them all. I was surprised to see so many photos of myself; some I’ve already forgotten about. I will treasure all these gifts as they’re very memorable. 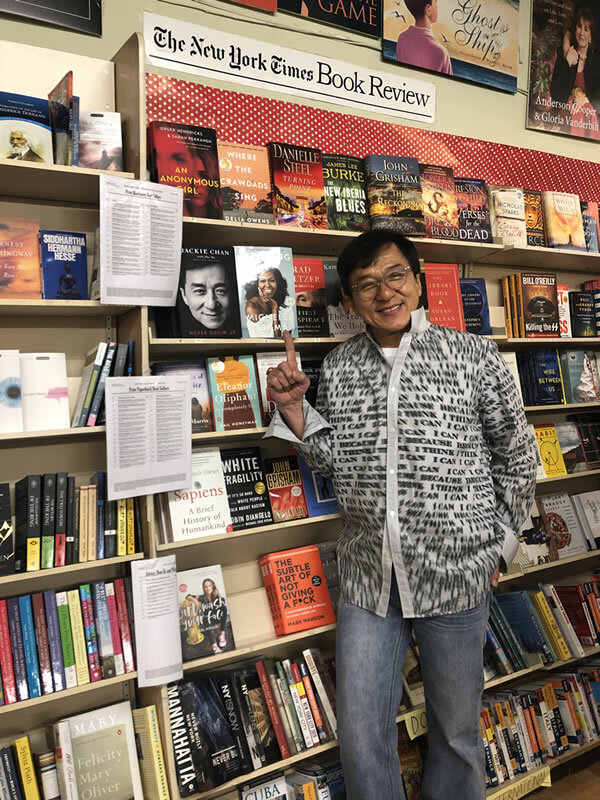 A heartfelt thank you to all my fans! Love you all. We’ve been filming in Prague over the past few weeks and we’ve finally wrapped for “My Diary” (Wo De Ri Ji). I’d like to take this opportunity to say ‘thanks’ to the entire production crew for their hard work and efforts. Now I’m heading to the airport for my next stop – Datong in Shanxi. 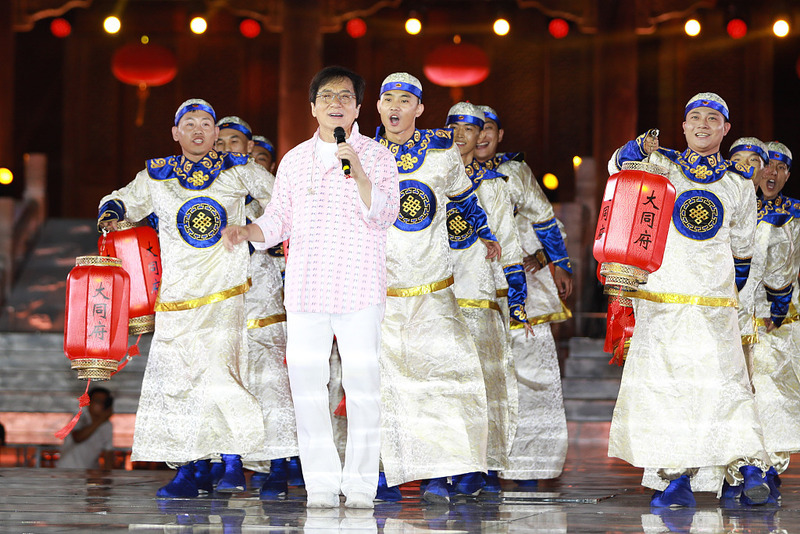 I have to rush back to China for my 4th Annual Jackie Chan Action Movie Week opening ceremony. After holding a few meetings in Beijing, I finally arrived at Datong. Datong is such a beautiful city. I instantly fell in love with the culture and historical buildings here. It’s like going back to ancient China; the buildings are so well preserved. Words simply cannot describe the beauty in front of my eyes. I was so busy with the opening ceremony yesterday, I didn’t get a chance to see how I performed until now. 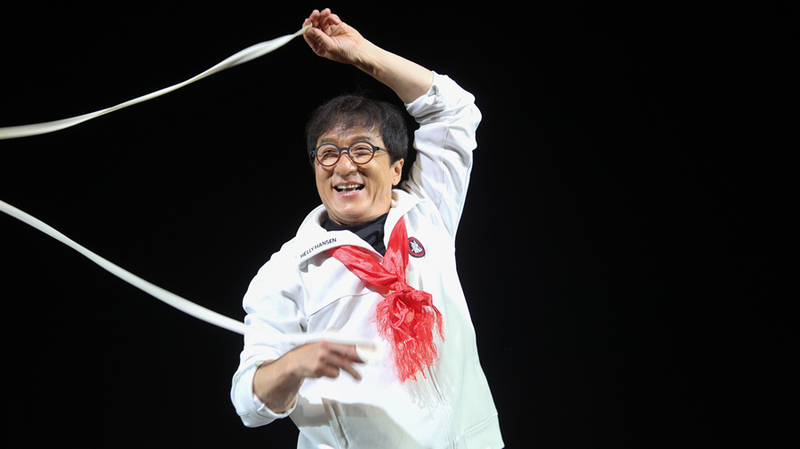 Last night was the opening ceremony for my 4th Annual Jackie Chan Action Movie Week. 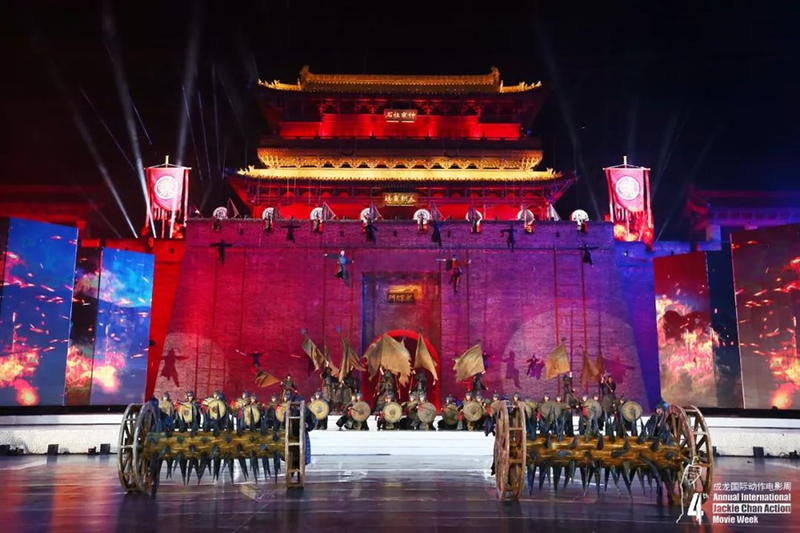 This year, we decided to hold the week of events in Datong, Shanxi province. 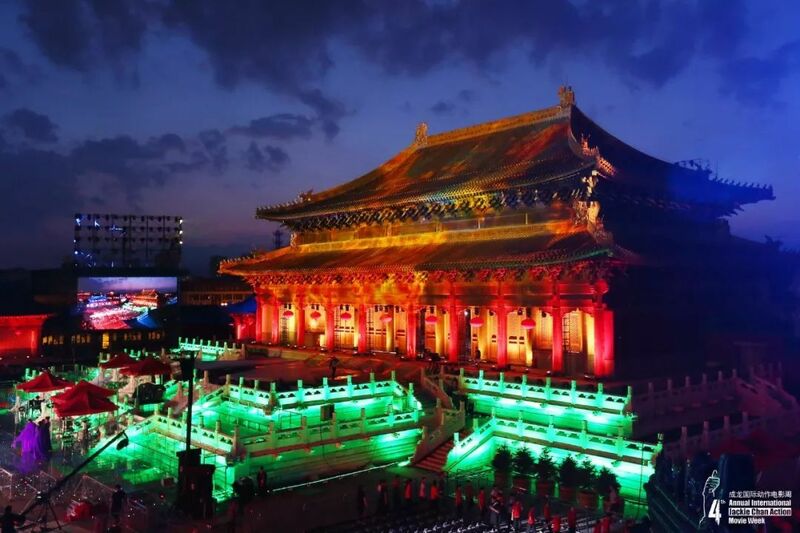 Datong is a lovely city with many ancient architectural buildings and structures still standing. 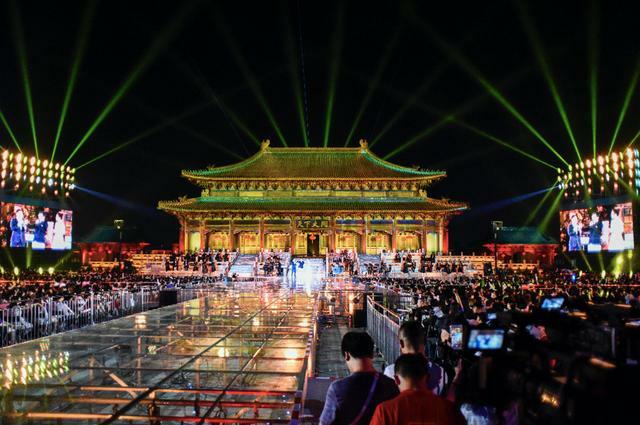 We decided to hold a concert for the opening ceremony, and I invited close friends Emil Chou, Sun Nan, Chang Shilei, Tia Ray, Ekin Cheng, Jordan Chan, Michael Tse, Chin Ka Lok, Jerry Lamb, and also a new boyband group called Le Hua Qi Zi NEXT. I sang a mixture of old and new songs, and I only just had a chance to play back the songs I sang yesterday. But I realised that I made a lot of mistakes. 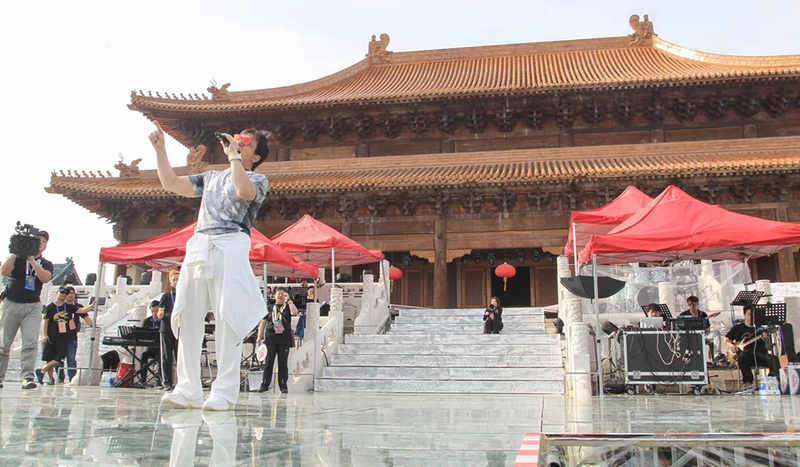 The venue was huge and during rehearsals, I heard a lot of feedback in my earphone while on stage. Technicians spent all afternoon trying to fix the issue. Luckily, everything was ready for the opening ceremony. As many of my fans already know, usually at the end of any event, I would ask the audience to pick up their own rubbish and squash all empty water bottles before putting it in the bin; and if the water bottles aren’t empty, take them outside and water the plants before squashing the bottle and putting it in the bin. I’d like to take this opportunity to say a big “thank you” to all my fans for your continual support and leaving the venue so clean. Today was another busy day. 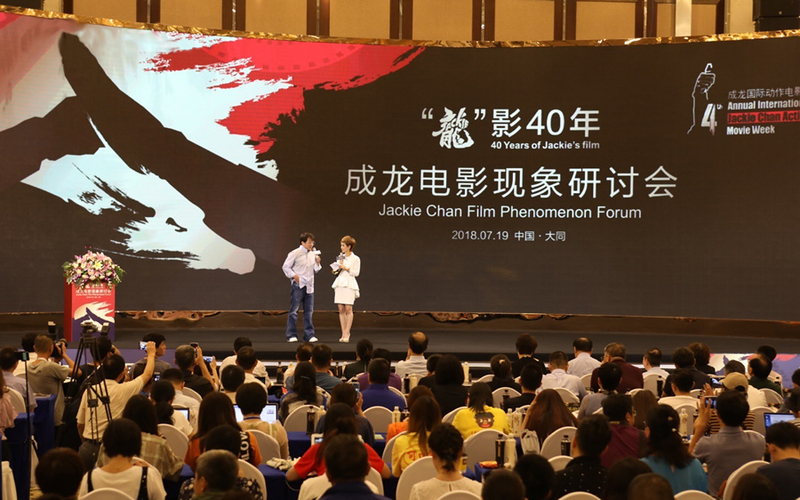 In the morning, I attended a discussion forum to start off the Jackie Chan Action Movie Week. 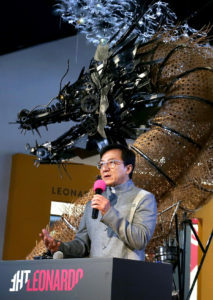 During the forum, called “’Long’ (translated as ‘dragon’) Movies – 40 Years of Jackie Chan Films”, I was happy to talk with many professionals and students in the field, and we discussed many things such as the current situation of Chinese action movies, the future of the Chinese film industry, and how we can develop it more internationally. For me, I think the most important thing when doing anything is to always do your best; just do what you’re supposed to do. As a filmmaker, we show do what filmmakers should do. 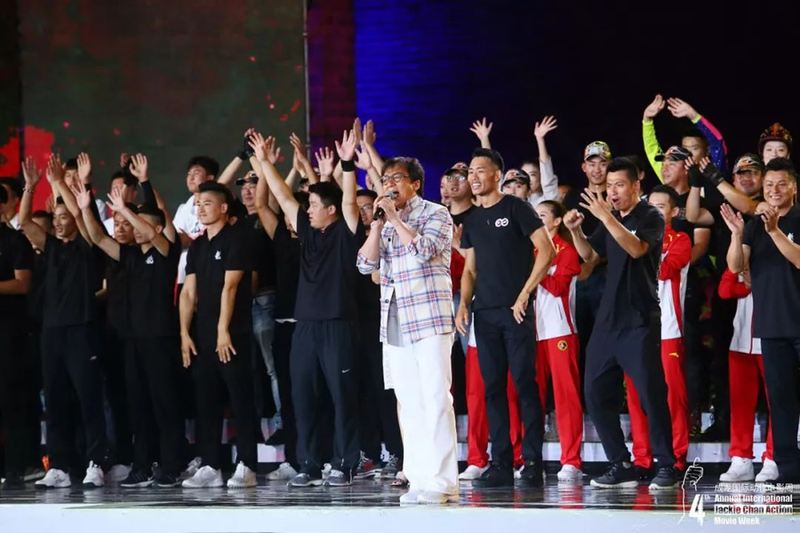 Jackie Chan is so little compared to an entire country. So, what I truly hope for is that every person in the film industry fully utilises their own power and influences to help the Chinese film industry break out and do something positive. 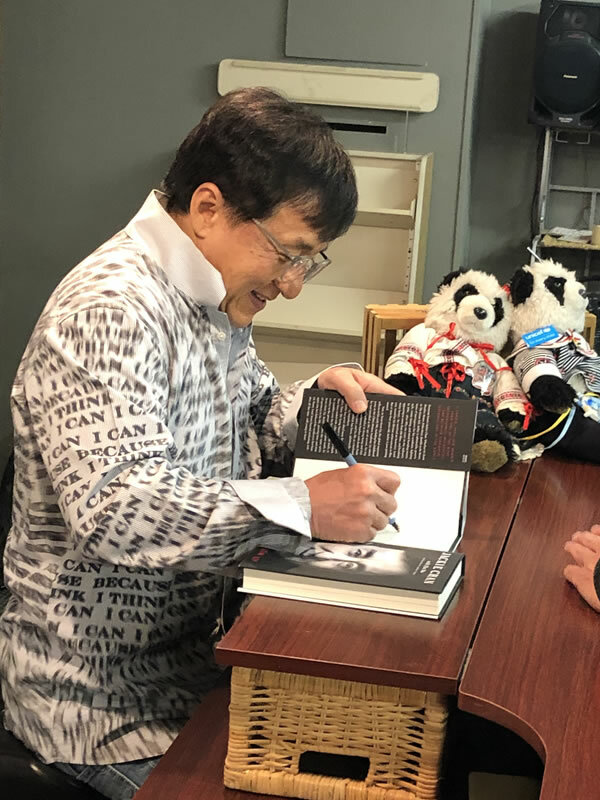 After the discussion forum, I gave a copy of my book, “Hai Wei Zhangda Jiu Laole” (Growing Up Before Growing Old) to everyone who attended. I hope that the new generation of action filmmakers can be inspired from reading about over 50 years of my experience in the film industry. I woke up very early this morning because we had to leave at 8:30am to a place called Xiping Zhen in Datong. 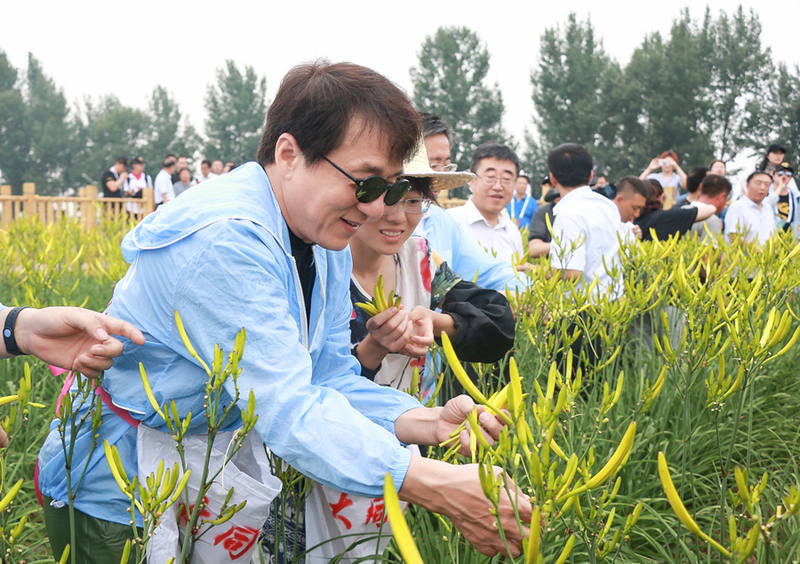 My staff had arranged for us to go to the local village and help plant Huang Hua (yellow flowers). As soon as we arrived at the village, I was so happy because I saw many locals came out to welcome me. Local officials were very kind and explained the local agricultural lifestyle. I wanted to try their work so I changed into their specialised working clothes and shoes, attached an empty carry bag for my harvest, and went out to the fields with the farmers and started picking the yellow flowers. Even the local workers said that I was a fast learner and picked the flowers like a natural. While I was picking the flowers, I said to my staff that charity work is not just about donating money, we need to fully understand what the local people are doing, how they are doing it, and what they need. We should use our influences to motivate the local people to develop and progress, and help improve their lifestyle! 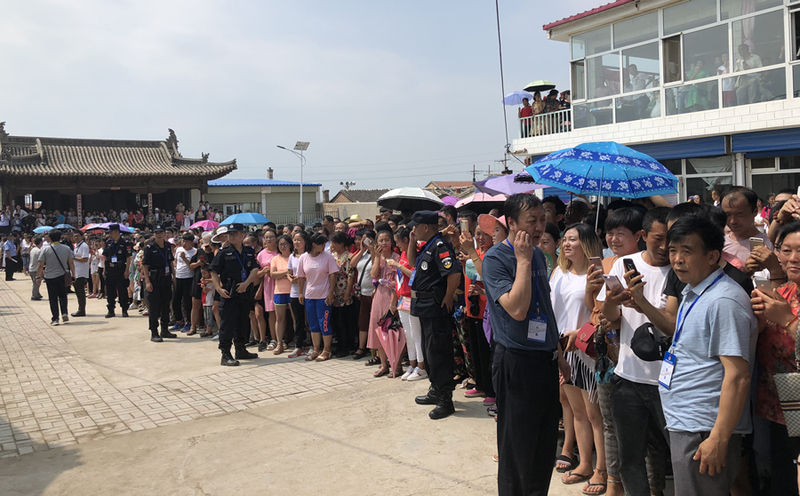 After picking some yellow flowers in Xiping Zhen, I jumped into the car and rushed to our next stop, Shenxi Village in Huyuan County, to visit the poverty stricken local villagers. I first went to visit 2 particular families whom my staff said were extremely poor. The first couple were so poor that they didn’t have enough money to visit the doctor and became very sick. I asked how their health was doing and wanted to know more about their current situation, and gave them a small donation. 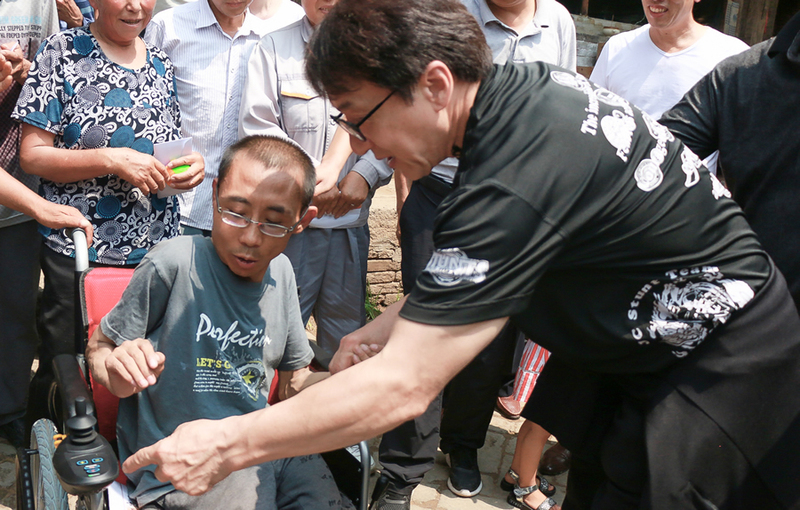 I gave electric wheelchairs to other local villagers who were in poverty because of their disability, and taught them how to use it. I didn’t have much time but did my best to visit as many families as possible. Before I left the village, I told them that they have big support from our country, and small support from people like us. Helping you and the poor is not just for show! We and the entertainment industry is doing our best to help all of you! After visiting the poverty-stricken families, I rushed back to the hotel and continued with doing media interviews. Some reporters asked, what left the deepest impression on me today. 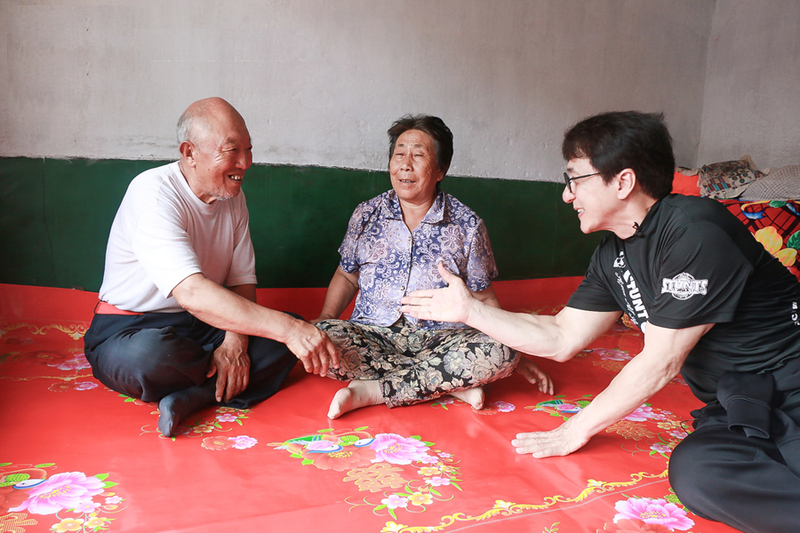 I replied, “My deepest impression from today was seeing the smiles on the faces of the local villagers.” Previously when my Jackie Chan Charitable Foundation did charity work visiting many different areas in poverty, the places we visited were really poor, their homes only consisted of 4 walls. Today when I visited the local families, I saw most houses had TVs, nearly everyone had a job, and the locally grown produces were very nice to eat. Seeing how everyone was happy made me even happier! I hope I can help these people and make their lives even better. I guess because I’m getting older, I’m slowly realising how time is actually very precious. Every time I make a movie, it’s actually one less movie for me to make in my lifetime. That’s why even though my knee is in pain, I don’t want to stop or take time off to fix it. And I hope I can use less time to do more charity, and use every possible opportunity to do more charity. I’d like to take this opportunity to say a heartfelt thank you to Datong for giving me this opportunity to help so many people today. Today was another busy day. 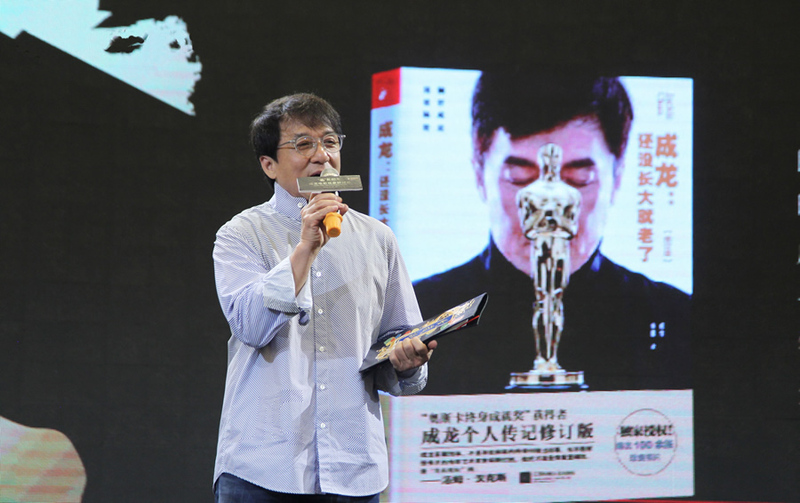 I attended an event in the afternoon with many well-known artists and directors in the entertainment industry such as Huang Xiaoming, Wu Siyuan, Chin Ka Lok, and Ding Sheng, as well as representatives from production companies and local Datong officials. During the event, we discussed many things about making movies, the film industry, and how we can better develop the relationship between film and cities. I took the opportunity to share a little about my 56 years of experience in the industry. I remember when I filmed the first Police Story movie, I pretty much shot all the places around Hong Kong. 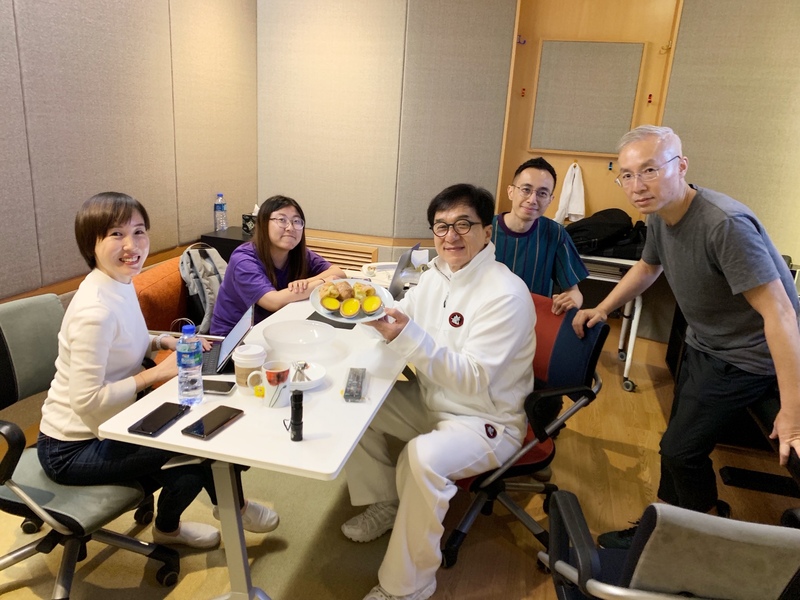 Every year, many of my fans from all over the world would come to visit Hong Kong and try to find the places where I filmed. After filming Hong Kong, I decided to go out and start filming around the world. In the movie Who Am I, the building in Rotterdam where I jumped and slid down the side has now become a tourist attraction! That building is now quite famous. Many people would especially stop and take photos. For me, I can easily fall in love with a city because of a movie. So, I hoped to take this opportunity to use the power of tradition and culture, to show the beauty of China and its cities to the world. 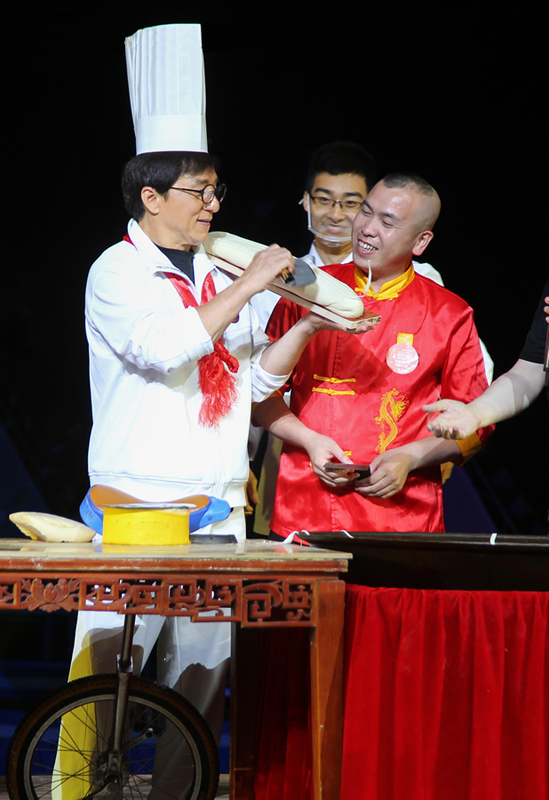 After attending the forum, I rushed to my next event… performing local noodle making! I’m not sure if you remember the movie where I made hand-made noodles (Mr. Nice Guy). Its been that long since I made fresh long noodles like that. I had a lot of fun and it brought back many happy memories. 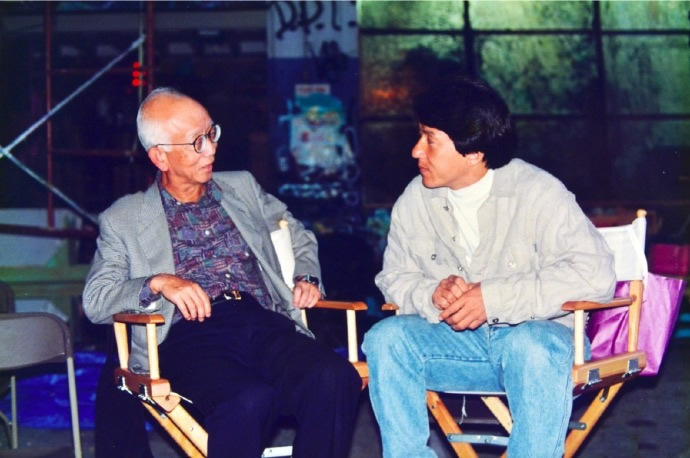 Time goes by so fast – at a blink of an eye, the Jackie Chan Action Movie Week has come to its last day. The closing ceremony was also an awards ceremony, but what touched me the most was a special performance by 33 members of my JC Stunt Team. They specially choreographed an act called “I’m a Stuntman” (Wo Shi Dongzhuo Ren), bringing to life what it’s like for a stuntman on the set of a movie, performing jaw dropping stunts on the stage, using their own bodies to crash through glass windows, twice jumping off a 6.5m high platform without any safety measures, and everything was shown live! Watching their performance, so many memories flashed back in my mind and I was moved to tears. I’d like to take this opportunity to thank my JC Stunt Team, thank all movie makers and stuntmen in the film industry, and I’d like to pay tribute to these wonderful people who are usually not known on screen because it’s your hard work and beautifully choreographed action that brings additional life to the silver screen! Thank you! 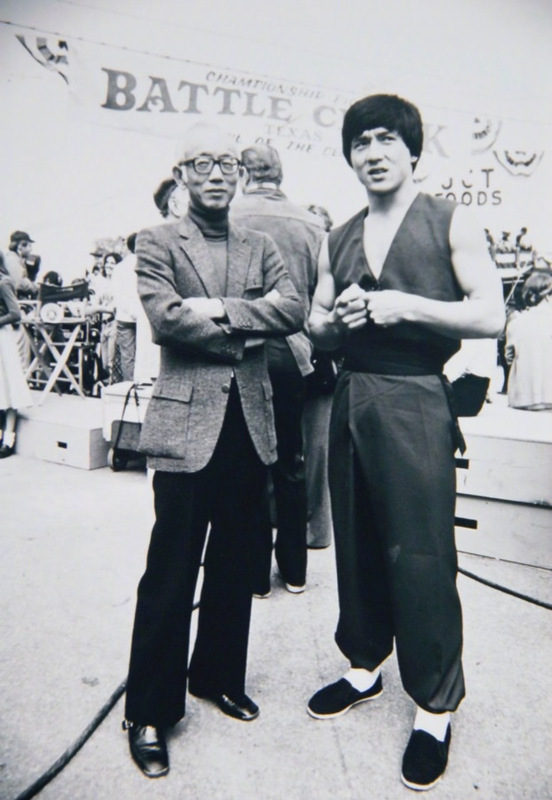 Golden Harvest gave me new opportunities and chances to make movies I really wanted to make. 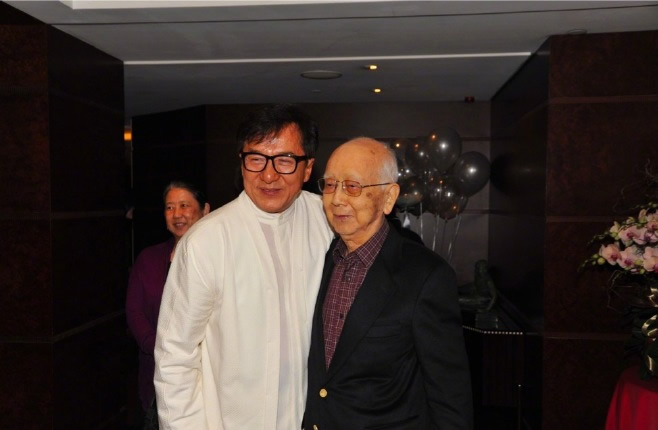 Mr. Chow had unconditional trust and belief in what I could achieve, and I’m deeply grateful for that. 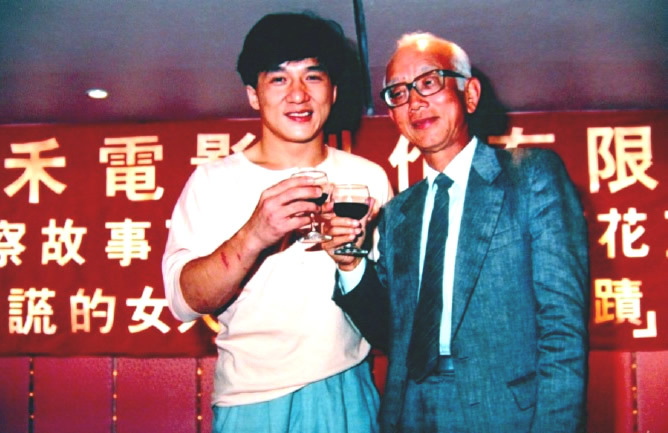 One unforgettable experience back in 1986, while filming Armor of God 《龍兄虎弟》in Yugoslavia, I had a very serious accident and everybody thought that I was going to die. Someone called back to Hong Kong and as soon as Mr. Chow found out, he immediately made arrangements for a specialist doctor, a well-known Swiss neurologist, which ultimately saved my life. 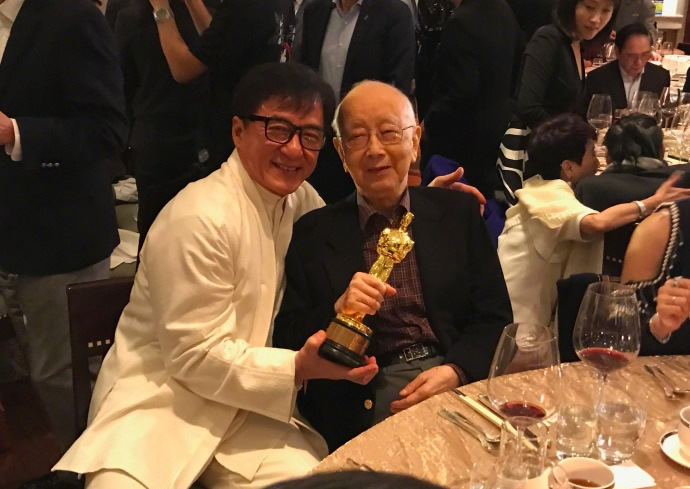 For decades, Mr. Chow was not only my boss, he was my teacher, my mentor, and the most respected model example in the film industry. 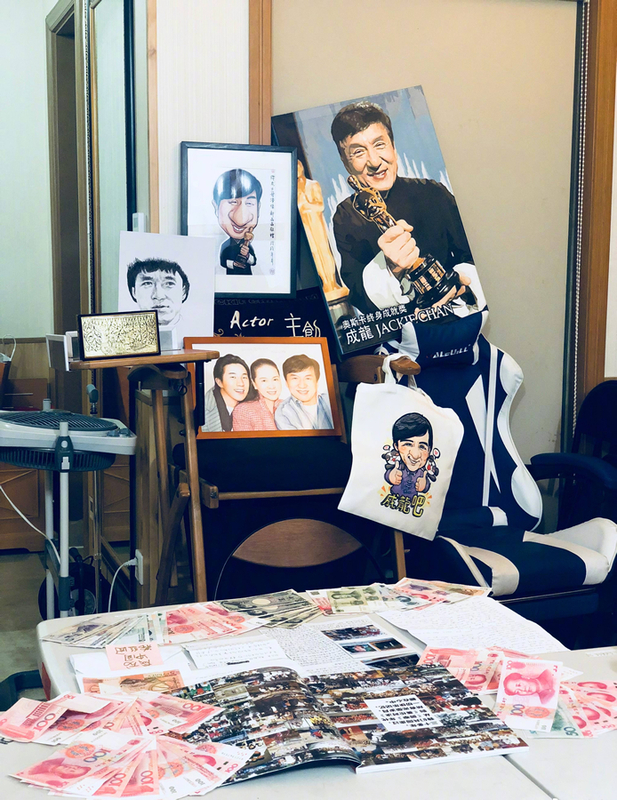 He’s an icon of an era in the history of Hong Kong and Asian film. Mr. Chow, may you rest in peace. I will always remember your energy, your trust, and all the things you’ve taught me.